https://3ccontactservices.com/third-party-contact-centers-competing-big-boys/ How Third-Party Contact Centers Are Competing With the “Big Boys" Steven 3CContact Services 2015-05-05T09:40:52Z 2016-08-18 21:59:11 Blog How Third-Party Contact Centers Are Competing With the “Big Boys"
If you’re searching for a contact center to handle your needs, you’re likely looking to the major players in the industry. However, you may want to consider a third-party contact center in your search for the ideal partner. As the leading provider of third-party call center agents, 3C Contact Services tells those considering hiring a contact center to look below the surface, as third parties often provide services that are a good match for a business’ needs. Here are just a few of the ways that third-party call centers provide a level of service that is on par with, and often exceeds, what major corporations offer their customers. Be it inbound or outbound services, a third-party provider will usually offer the same services at a fraction of the cost. Regardless of the specialized field you wish the agents to be experienced in, remember that just because a call center isn’t recognized as a major player next to multinational corporations, that doesn’t mean that it can’t provide the same level of service. A third-party call center will always provide their clients with the same level of professionalism that they would expect from a larger organization. If you want to research the level of service a company you are considering will provide, try acting as a “mystery shopper” and call them as a prospective customer. The staff at these call centers will usually have the same know-how as their counterparts at big organizations; in fact, they may just have better training in place for their agents. Regardless of who you are choosing, always look at the training they have in place for their agents, as well as their turnover rate. In order to compete with larger and more established organizations, third-party call centers will often provide their clients with value-added services on top of the cost savings. This may include programs to help you improve your business or streamline your order-taking process. Third-party providers will provide you with the same level of productivity as big-name companies and can respond to calls just as quickly. And should any issues arise, it will take less time for resolution, as it’s clear which role each member plays; with larger businesses, a client may be transferred several times before they reach the right person. 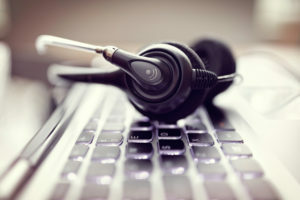 Even though they’re smaller in size, many third-party call centers will still use industry-leading technology, such as automatic call distributors (ACDs) put in place to properly route calls and e-mails, computer dialling for outbound calls, and, because client information is so important, disaster recovery. They should also have the same call monitoring and reporting as large call centers in place as well. Perhaps the biggest advantage of hiring a third-party contact services provider is the simplest and most logical: they will provide the same level of service as a big-name company, but at a lower price. For more information on the benefits of third-party call centers or to inquire about our services, contact 3C Contact Services today.